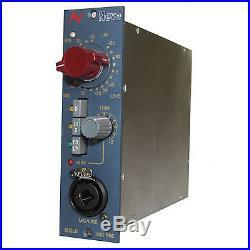 AMS Neve 1073LB 500 Series Lunch Box Mic Pre. Designed and manufactured in England, the 1073LB retains the unique sonic characteristics of the original 1073 Classic microphone preamplifier by using the same architecture, matching components and original hand-wound transformers. And it delivers it in a modern and portable form-factor that professional producers and engineers demand. With new features like a fine TRIM control, switchable microphone input impedance, signal presence LED, intelligent protected switching of front combi-XLR input connector and Neve's clever Audio Processing Input design, the 1073LB takes your 500-series rack to the next level. Simply install into an empty slot in your compatible 500-series rack, connect your microphone or line level signals and inject that legendary sound into your audio creations. Classic transformer microphone preamp amp (Class A design). Both Mic and Line inputs are transformer balanced and earth free. Gain knob with Signal Presence LED. +5/-20dB level Trim control with integrated phantom power on/off switch. Phase, Impedance and Front Input selector switches. Front combi-XLR connector with intelligent switching of phantom power. Design allows processing from adjacent Neve modules in same Lunchbox to be inserted into the 1073LB's pre-output stage. Microphone Input: Gain -80db to -20dB in 5dB steps. Freq Response: ±0.5dB 20Hz to 20kHz, -3dB at 40kHz. Crafted in England by Neve engineers. THE MOST COMPLETE MUSIC STORE IN THE WORLD. The Most Complete Music Store In The World, Period. BEST OFFERS - Please submit offers directly using the "make an offer" button. Alto Music reserves the right to refuse any return if it appears the item has been used. There are no warranties for the following items: Strings Drumheads Drum Sticks. The item "AMS Neve 1073LB 500 Series Lunch Box Mic Pre" is in sale since Thursday, August 11, 2016. This item is in the category "Musical Instruments & Gear\Pro Audio Equipment\Preamps & Channel Strips". The seller is "altomusic" and is located in Middletown, New York.